The performers of La Donna Musicale. Photo: Meiqian He. It's unusual that a musical "discovery" really counts as one; many "lost masterpieces," once revealed, turn out to have gorgeous moments, yes, but also enough flaws to make you understand why they slowly slid from public view. "Why hasn't anyone played this for three hundred years??" 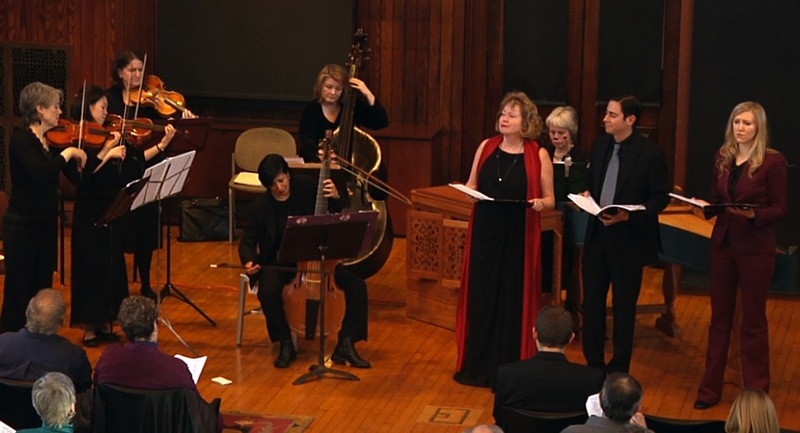 the publicity for this or that rediscovered opera or oratorio usually asks in disbelief; but an hour or two into the work in question, you usually feel you have a pretty good idea why it has been gathering dust for centuries. But last weekend, after hearing a single performance from La Donna Musicale - which is devoted to forgotten female composers - I couldn't help but feel that Camilla de Rossi's The Prodigal Son was something different. This isn't just women's-studies fodder; it really is a discovery; it's simply a wonderful oratorio - Handelesque, yes, but in a voice, and from a perspective, that feels somehow individual (and in some deep way female, which is important). We know very little (almost nothing) about de Rossi, other than that much of her work was commissioned by Joseph I of Austria, and that her signature included the appellation Romana (denoting Roman descent). There are four extant oratorios bearing her name, along with a small clutch of cantatas and other works. Perhaps The Prodigal Son is her one masterpiece - perhaps; but if not, there's a small treasure trove of great music out there just waiting to be brought into the repertory. And my gut is that Ms. (Miss? Mrs.?) de Rossi (Romana) will eventually be seen as deserving her own niche in the pantheon of Western music. It's easy to believe that sexism is behind de Rossi's obscurity, but frankly, thoughts of political injustice quickly fade before works like this one; the music's just too good, it's all you end up thinking about. 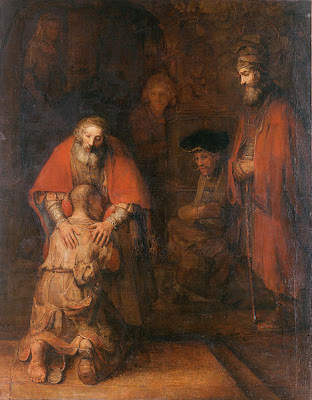 That and the unique emotional perspective that the composer (and probable librettist) brings to the familiar parable from Luke (Rembrandt's peerless vision of the prodigal's return, at left). For de Rossi, the parable is clearly about a family dynamic rather than the personal journey of a wandering scion; indeed, she only lightly treats the prodigal's misadventures, lavishing far more attention on his father, brother, and mother - who it's worth noting goes unmentioned in Luke, but is deeply considered by de Rossi. What's more, the prodigal's brother, voiced by a soprano, is clearly conceived as a kind of Diana/Artemis figure - which gives a mysteriously fresh, trans-gendered edge to the story, and makes one ponder de Rossi's own biography with some sympathy; after all, she wandered far from home, didn't she - yet always kept that home as part of her signature. It would be a mistake, I suppose, to make large claims about de Rossi's style based on a single work - but what is noteworthy I think about Prodigal Son is its plethora of highly singable melody, and the surprising formal flexibility - almost looseness - of its structure; you were never quite sure what might be coming next in musical terms, but somehow a consistent underlying tone gave the whole piece a subtle sense of unity. The performance from La Donna Musicale was, I'm afraid, a little less unified - though always adequate, and at its best peerless. As de Rossi's mournful mother, the widely-admired Julianne Baird effortlessly took center stage - the oratorio almost seemed to be about her - and was consistently superb in both her exquisitely rich singing and poignant emotional presence; I'm desperately hoping Boston will see Ms. Baird again, and soon. I was also taken with newcomers Pablo Bustos, who brought a light but sweetly expressive tenor to the role of the prodigal's father, and soprano Kimberly Moller, who though a bit shrill at her top, sang with clean, confident control - thus effortlessly communicating the self-command (and, eventually, rising anger) of the prodigal's brother. Alas, the one gap in the vocal ensemble was the Prodigal himself, Gerrod Pagenkopf, whom I've admired elsewhere, but who seemed here to struggle with the low end of the role, and whose dramatic performance leaned more toward pique than impetuous yearning for liberty. Meanwhile the instrumentalists, though conducted with spirit by director Laury Gutiérrez, and playing with suitable passion, struggled with tuning issues, particularly in the first half of the program (re-tunings at intermission, and later in the second act, mostly corrected the problem). Despite these occasional missteps, however, I was still impressed with La Donna Musicale - as I was very impressed with their programming. Who knows what other great works by forgotten female composers may be out there? We're lucky to have ensembles like La Donna Musicale out there digging for them.